In the Apr/May 2019 issue of MaryJanesFarm, “Possibilities” (on newsstands March 5), I led you here to my journal for a chance to win a FREE purple and white heirloom Sweet Lena iris rhizome grown here at MaryJanesFarm. Find out more about my Sweet Lena here. Pink or red tulips. They scream spring! I love the bulb flowers that date to bloom this time of year. So give me crocuses, daffodils, narcissus, and maybe for fun through in some prim roses even though they’re not from bulbs. I love most flowers, but the peony would be my all time favorite, the ones with the great fragrance. Would love to add your Iris to my garden too! I love peach colored roses! Right now I have some yellow iris. I think the purple would look great with them. My favorite flowers are pincushion protea, but they don’t grow where I live! Anything with PINKS that gives hope to spring! Tulips or any flower! I love decorating for Valentine’s Day because it’s like a little bit of “spring” in winter. For me the key here was “favorite Valentine flower” so I have to say Roses. I love all kinds of flowers….but for Valentine Day….Roses. Thanks for all these great opportunities to win cool prizes! I love any kind of flower! For Valentines, I enjoy Carnations, tulips or Daffodils! Although I wouldn’t refuse any bit of beautiful bloom during our mountain winters!! Daisies are the best anytime! My favorite flower would be a Tiger Lily. They are near and dear to my heart. So they are perfect for Valentines Day. My favorite Valentine’s or anytime flower is always the same. I LOVE pansies. My favorite Valentine Flowers are tulips and daffodils because they say spring is just around the corner! This year it was bright yellow daisies and miniature purple irises! 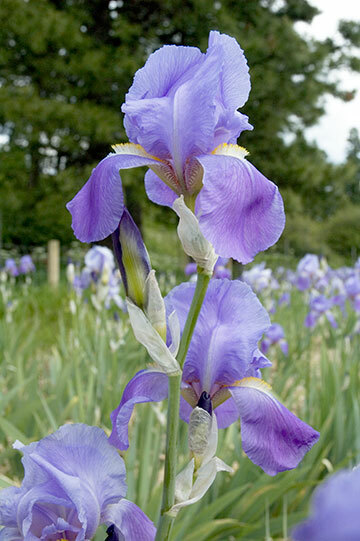 I would love to get a Sweet Lena Iris, Iris’s are one of my very favorite flowers of the summer. Marigolds are another of my favorites, the help keep the bugs from the garden. I have always loved carnations for their sweet, somewhat spicy fragrance!! A large bouquet of white carnations…of course, I love irises. My late grandmother grew irises. I wish I still had some of her rhizomes! My favorite bouquet would be lily of the valley and muscari because I can’t pick one over the other. The smell is intoxicating and I love their tiny bells! I’m not sure I have a favorite, I love anything that blooms. A bouquet of sweet smelling peonies of any color says happiness, prosperity and romance for valentines. I love irises, but my favorite flower is calla lily. I love all the colors and don’t mind that the colored ones are tiny! I really enjoy house and garden flowers. Really appreciate the beauty of African violets and orchids. My grandma had African violets always blooming in her house. My mother also raised African violets. I have been fortunate to be able to raise violets even though my 2 sisters are challenged. They grow other house plants but guess I got the violet growing gene. Have expanded to orchids as roommates for the violets. I do have an expanded Iris bed as well. Would love to add more iris. I love all flowers, but for valentine’s day, I would have to say a red rose. I love them. Have ordered these before but i left them when i moved. I guess i should have dug them up. They are beautiful. I love all flowers, so any received for Valentine’s Day are my favorite!! For Valentines’ it would be pink or red roses. Very romantic. My favorite Valentine’s day flower is roses! I loved to cut forsythia to force by spring. The yellow flowers would lift the spirit. My favorite flowers are whatever my husband gives me because it is filled with his love. My husband always gives me hydrangeas, with the occasional lilly. Pretty blues and pinks. Yellow roses are my favorite for Valentine Day. However, love any and all flowers at any time. Seeded eucalyptus is really special. Thank you for your invitation to participate in this ..well I’d have to say that any flower that is deep red…in any form would be my favorite Valentine’s flower….dried in the form of petals for potpourri..or ground into a fragrant rose body powder.. fresh in a vase on a table or bedside..or maybe a heart shaped wreath.. I just moved to idaho… at my husband’s parents ranch..it just so happens that his mom’s name is Iris..and I’d like to create an honor garden for Iris..so these rhizomes would help me begin to root here in the earth and honor my husband’s mother and father..